When your dog is diagnosed with cancer, it is important to be proactive. The first thing to do is to give them the best nutrition. 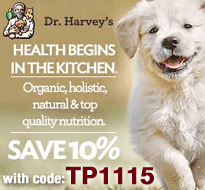 Start now with this 10% off coupon code for Tripawds when ordering Dr. Harvey’s exceptional health foods for companion animals. NOTE: This offer expires 11/15/15! Please see sidebar for any current Dr. Harvey’s promotions. Dr. Harvey’s foods are the best you can buy for dogs, especially those who are fighting cancer. The decision to prepare homemade dog food is one of the most important steps that you can take for your companion. It’s home cooking for dogs made easy: Just add water, meat and oil and offer your dog the gift of health from you kitchen. In just minutes, Dr. Harvey’s best-selling Veg-to-Bowl makes the perfect healthy homemade dog food. Allows total control of protein amounts because you add the protein. Free of all preservatives and additives, coloring agents and dyes, sugar and salt. Contains no fillers, no corn, no wheat, no soy. Don’t miss the full Dr. Harvey’s home cooked dog food review from Tripawds Spokesdog Wyatt Ray! This post is sponsored by Dr. Harvey’s. We are being compensated for helping to spread the word about their food and nutrition products, but we only share information we feel is relevant to our readers. Dr. Harvey’s is not responsible for the content of this article. An Easy Way to Feed Dogs Real Vegies and Meat!